Fungal biomolecules provide key biosynthetic tools and platform chemicals to produce many important drugs and pharmaceutical products. As these biomolecules are currently produced in small quantities, many companies seek to develop fungal biotechnology to enhance low-cost production of target biomolecules. Additionally, fungal metabolic system is a fundamentally controlled process and the regulations of metabolism are exceptionally receptive to physicochemical stimuli that happen because of environmental and cellular conditions. We mine the potential of native fungal candidates to produce pharmaceutically-relevant enzymes, especially carbonyl reductases (CR) and lipase (LP) as key pharma enzyme and, by improving production processes, aims to increase fungal product yields. CR are used in the preparation of beta-lactam antibiotics which are intermediates in the production of penicillins and cephalosporins. LP from fungi has been used to synthesize lovastatin, a drug that lowers serum cholesterol levels. Also, the production of 2-arylpropanoic acid derivatives is primarily accomplished through the catalysis by LP. Thus, it is necessary to understand metabolic mechanism of the novel fungal biomolecules synthesis. Our strategy is to develop an efficient and low-cost process that enhances production of pharmaceutically-relevant, broth-based fermentation products from fungi. 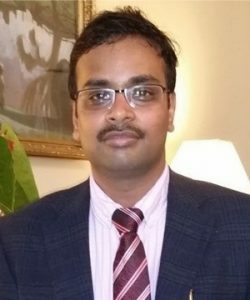 Dr. Vijai Kumar Gupta is the Senior Research Scientist, Microbial Biotechnology at ERA Chair of Green Chemistry, Tallinn University of Technology (TUT), Tallinn, Estonia. Before joining TUT, he worked as Senior Researcher for good few years at MGBG group at Department of Biochemistry, National University of Ireland Galway, Ireland. He is one of the leading experts in the area of- Microbial Biotechnology and Applied Mycology. He has received a many national and international awards and the fellow of societies of international repute including Linnaean Society; Mycological Society of India; and Indian Mycological Association. He is the editor of few well reputed journals including, PLOS One, BMC Microbiology, BMC Fungal Biology and Biotechnology, Microbial Cell Factories, Scientific Reports and Microbiome and edited 27 books, for internationally reputed publishers like Elsevier press, Wiley-Blackwell, Frontiers, Taylor and Francis, Springer-Nature, CABI and De Gruyter. Also, he has 91 papers in his hands in internationally reputed journal and developed 02 IPs in the area very efficient and low-cost methodology for producing enzymes.